Live online tutoring is the most modern way of teaching as it incorporates the benefits of face-to-face teaching and online studying. It is based on the real-time interaction between the student and the teacher via video chat. The lessons take place in a virtual classroom with a variety of interactive features and learning materials. One of the most significant benefits of the internet is the limitless ability to exchange knowledge. Nowadays it is easier than ever to learn new skills, to improve your language proficiency, or to advance your education and qualifications free of the restrictions of space and time. Online education makes it possible to study or teach at the most convenient time and place for you. Online learning is studying in a virtual environment. What’s the difference between online tutoring and live online tutoring? Online education includes two main forms of learning. The first form of online teaching is through self-paced lessons and courses. Tutors pre-record every lesson and provide it to students via different online channels and platforms. The learners can watch and study the lessons whenever they want. They have the ability to pause the lessons and to watch them multiple times. What is the difference between online tutoring and live online tutoring? As its name suggests, with live online tutoring everything happens in real time. Students and teachers share the same learning space (the virtual classroom) at the same time, even if they are physically apart from each other. Live online teaching has a lot of the benefits of in-person tutoring in a conventional classroom. Live online classes were first introduced over 20 years ago by NetTutor back in 1996. However, a lack of advanced technologies, as well as a fast and stable internet connection, were an obstacle that prevented this form of online studying from flourishing. Rapid technological advances over the past few years have made live online teaching not only possible, but also the preferred method of studying for more and more students from around the world. The latest platforms for online tutoring and courses are creating the perfect virtual environment for teaching various subjects with an abundance of resources and features at your fingertips. What are the main advantages and disadvantages of live online tutoring? Live online teaching is a blend of the face-to-face tutoring and online learning. Education is no longer limited to the walls of conventional classrooms. Today, students can receive a personalized learning experience based on their needs and preferences in order to get the most out of every lesson. Convenience – Online studying occurs in a comfortable physical environment and in a very interactive virtual environment. Students and teachers choose the most convenient time for the lessons. Affordability – The ability to save money by not having to travel to school and to the classroom, as well as the option to teach more classes during the day, allows teachers to offer their services at lower rates compared to traditional tutoring. Efficiency – Having access to a large diversity of resources, learning materials, and experts makes the studying process more effective and rewarding for the students. Less non-verbal cues that teachers can use – Conventional tutoring in a traditional classroom includes not only verbal, but also non-verbal expressions that teachers can incorporate into their lessons. Body language can help to emphasize the importance of the learning material. Live online classes are based on interaction via video chat. Tutors can use their face and voice to enrich the lesson, however, in general, non-verbal cues are more limited than in traditional teaching situations. Less suitable for some subjects – Thanks to new technological breakthroughs and advanced teaching platforms, it is now possible to teach more and more subjects online, including science and chemistry. However, there are still subjects that are difficult to teach online. Less of an emotional connection with the students and more difficulty keeping their attention – Even though live online lessons consist of direct interaction with students, it can be challenging to hold the attention of the learner on the screen. Access to experts – Online learning provides excellent opportunities to take lessons from experts even if they are located in other parts of the world. Access to resources – Students are no longer limited to local sources of learning materials, like libraries, etc. They can access a wide variety of books, videos, projects, articles, etc. that are recommended by the tutor. Access to tutors – With online learning students can reach their tutors more often for consultations, assignment submission, questions, and additional lessons. Affordable lessons – In most cases, online education is more affordable than traditional classes. Safety – Students learn from the comfort of their own home (or any preferred location). Time saving – Students choose their schedule for classes in order to make the most of their time. Rewarding learning experience – Live online live tutoring sessions offer a similar experience to face-to-face teaching. The lessons can be recorded and watched again by the students when needed. A bonus benefit is for the parents – They can be more involved in the learning process by observing the lessons and re-watching the tutoring sessions. Do teachers need to master tech skills in order to teach online in real time? Tutors need basic tech skills in order to use modern teaching platforms. Fortunately, the user interface is very user-friendly and easy to navigate even for teachers who are not so tech savvy. Live online teaching requires a video recording platform, a web cam for video chat, a microphone and audio feature, presentation software, and teaching skills. 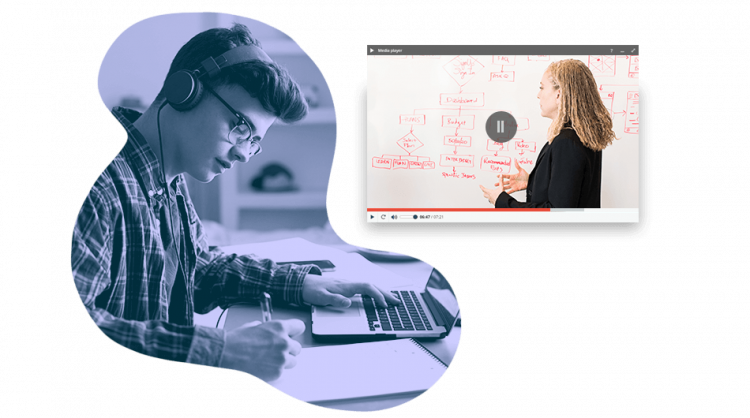 Modern teaching platforms offer everything in one place, including an interactive white board, share-screen capabilities, and many more features to create an exceptional learning experience. Tutors can easily create captivating and interesting lessons that meet the needs of every student. There are plenty of ways to organize the virtual learning space just the way you like it and to create a database of materials, classes, and resources. Live online tutoring today is truly a remarkable and rewarding experience.